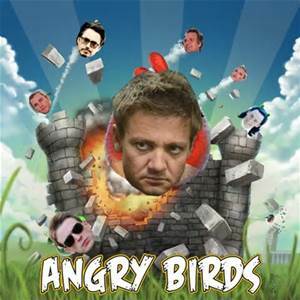 My minions….er pigeons | Why do the voices in my head sound like the Avengers? Minions and pigeons. I haven’t even seen the movie with the “minions” but I see them all over the internet. They are cute little buggers. I often hear slaves and people who follow others called Minions. So I went with it…..These are Loki’s minions…. Tony: Oh crap. We have company. Thor: What beautiful wildlife you have on your world. Such lovely colored feathered creatures. Clint: Yup, my harem is here. Natasha: Oh for god sake Clint, do you have to take them everywhere we go? Bruce: That one’s kinda cute. Me: He looks like Thor. There’s a crest of white, like lightning down his back. Clint: That one over there looks like me. Me: No, that one’s Loki. Thor: Loki? How do you figure it’s Loki? Me: Because. Look at how it’s strutting around, puffing itself up and pushing all the others around. Definitely Loki. Thor: No, you are mistaken. That one is clearly not Loki. It is chasing Thor. Me: Yup, and now it’s stealing the burrito from Thor. Loki I tell ya. Clint: Hehe. That funny looking big one must be Bruce. But it’s the “other guy” Bruce. Natasha: There are more coming. Quit feeding them Cat. Me: They are coming for my cheerios. Honey Nut. Yummy. Damn, that was quick. You guys just inhaled all my cheerios. Clint: We didn’t eat them, they did. Me: I know, but they’re you. All of you. Look now there’s 6 of them. Which one is Tony? Thor: That one certainly is not me. The one you call Loki is mounting it. I do not find this humorous. Me: Oh, Loki just chased away Natasha. Bad Loki. Tony: A jalapeno and an egg shell. There’s something you don’t see every day at a bus stop. Me: Someone must have been eating their lunch here. Weird. Bruce: Maybe the pigeons laid it. Maybe Loki laid it. Clint: HA! Loki laid an egg…..! Good one! Thor: The one called Thor has just defecated. That is ……disgusting. Clint: That’s pretty much all pigeons do Thor. They eat and poop. Eat and poop……and lay eggs occasionally. Me: This bus is taking forever. I am not feeding them any more of my cheerios. I am saving them for me.And Loki ate most of them. What a hog. Natasha: They left. Loki flew away and they all followed him. Pretty much how the internet fangirls do. Clint: My fangirls left me for Loki?! Me: Sorry Clint. Maybe you’ll find some new ones when we get to the depot. While talking to my “self” and the Avengers, I was scanning through my Mp3 player and came across a song I didn’t know I had, by Bruno Mars. Oh my goodness! I absolutely, positively love how you think! I could read this all day and never get tired of it! If I reach just one person I am ahead in the game right? Thanks for your comments. Be sure to go to the older posts from January also ok? Then you can see how dark my world is and why I created this whole thing!